The truth is most guitarists have a hard time learning songs by ear. Of course there are many methods of training your ear to improve this skill, but that takes time. There are literally millions of guitar TABs on the web, but you won’t be able to find TABs for every song you want to learn. We have all faced it plenty of times. On that note, I wanted to share with you a music transcription software I learned about recently. Note: I am not affiliated with them and will not receive any commission if you check them out, like it and buy. I just thought it was really cool and wanted to share it with all of you. Music transcription software can make the guitar learning process much smoother for you. I still recommend you include ear training in your guitar practice schedule. However using something like this is a solid aid while you are still developing. The software is made by the company Super Mega Ultra Groovy, and is called “Capo 3”. What it does is take mp3 files from your computer and transcribe them for you. 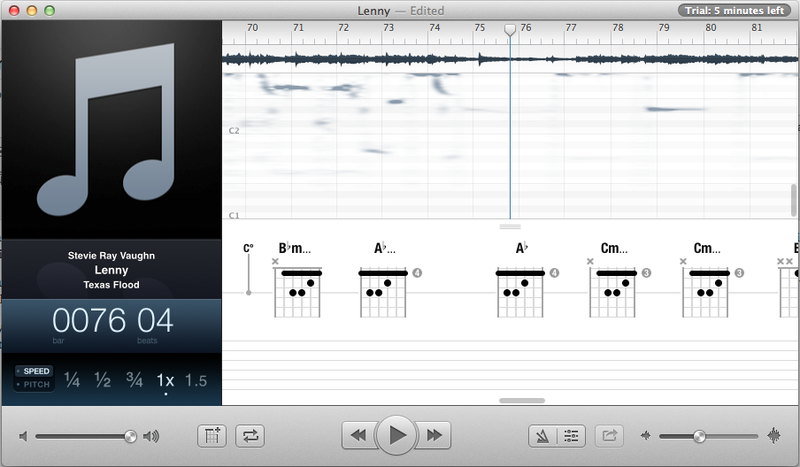 I haven’t quite figured out the tablature feature yet. You can download a free trial that lasts about 10 minutes. It is the full product I think.. The lines at the bottom are for tablature. You are supposed to be able to get the software to TAB the song out for you as well, but as I said I couldn’t figure it out in the time I had. Maybe if one of you wants to download the trial and see if you can figure it out. Capo 3 does look like a pretty legitimate software. The chord diagnostics are pretty accurate and even if the TAB feature isn’t all that great this will at least tell you what key each part is in and help you figure out the rhythm parts of the song pretty easily. Capo documents can now be shared easily via email, AirDrop, Messages, or by simply copying a file to another Mac. Now you can collaborate on transcriptions with your students or colleagues. Instantly audition the chord detection results with different frets and alternate tunings, so you can find out quickly where it’s most comfortable for you to play. You can check out Capo 3: here. There is a free trial button and a buy button ($29.99) at the top of the page. I recommend at least trying out the free trial. It’s pretty fun and very easy to use. Do you know of another music transcription software like Capo 3? Do you own it? I’d love to hear about it! Please share any experiences, comments, questions, etc below. I’ll get back to you within 24 hours, usually much sooner. Hey Deven, this could also be pretty useful if you want to copyright songs that someone writes. Interesting concept. Thanks for sharing! Hey Jim, that’s an interesting thought. I hadn’t considered that. I’m glad you found the idea interesting, though. Thanks for the comment! I have something similar to this with Band in a Box. It’s a great time saver when you write songs. Great post! Thanks for the review. Hey Eddie, thank you for the comment. I’m glad you liked the review. Band in a Box sounds vaguely familiar. I’m looking into it now. Does it to MP3 transcriptions as well? as far as input I believe it does. Capo 3 sounds really cool. The software seems legitimate and trust worthy. Thanks for the info. Hey Josef, thanks for the comment. I’m glad you found the review helpful. I’m glad you like it. Thanks for the feedback!